For a more distinctive look for condo markets, hotels, and offices. 16 gauge inverted end channels, welded in at both ends. 16 gauge surface closer reinforcing included at top of door. 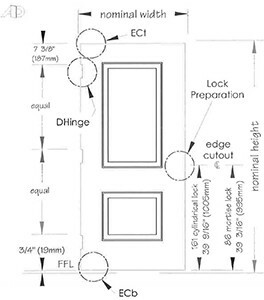 Door edges are bevelled 1/8″ over 2″. For Positive and Negative pressure Fire Labelling criteria, see publications. Artek Door Limited warrants its products to be free from defects in materials and workmanship under normal conditions of use and maintenance, for a period of one year from the date of substantial completion. Artek shall, at its option, repair or replace its product, which in Artek’s opinion are found to be defective. This warranty shall not apply to any products that, in the opinion of Artek, have been modified, repaired, altered, or damaged in any way during transit or installation. Artek will not be responsible or liable for any or consequential damages, nor, without limiting the foregoing, for claims for labour, material, loss of profits, personal injuries, repairs, or transportation or other expenses incidental to default under this warranty. All exterior doors must receive a “Top Cap” or else warranty is void. No representative, distributor, agent or employee of Artek has the authority to alter or extend the obligation of this warranty.